Only a short walk uphill from Cascades Park, nestled in the postage stamp of a historic neighborhood called Smoky Hollow, assembled within a tiny, mid-1940s bungalow, they gaze out from almost every surface. Towering bears and conniving foxes and sharp-antlered deer, shaggy mongrels and stray cats, cagey raccoons and stalking panthers, even a random human face or two, witnesses with empty eyes, all part of a gallery of animal forms, possessed of soul yet awaiting substance. Although such pieces command a vivid and provocative place in Hall’s practice — offering a gateway, if you will — they are only a fraction of her artistic endeavor, a kaleidoscopic, 35-year outpouring of work in nearly every medium at hand. It includes painting and sculptural pieces — tiny, doll-scaled tableaux staged inside boxes reminiscent of the American assemblage artist Joseph Cornell, surreal and haunted like a lingering dream — drawings, street murals, postcards, cheeky Christmas tree ornaments, masks (cats and bird faces for humans, human faces for cats and dogs), costumes and stage design, as well as collaborations with musicians, dancers, theater troupes and filmmakers that evoke ritualistic elements, primal mysteries and a boisterous spirit. “It feels important to me that people who approach my work be attracted to the mystery of it,” said Hall, who feels a great kinship with idiosyncratic creators far and near, from the Czech animator Jan Švankmajer to the late Tallahassee folk artist O.L. Samuels. Tallahassee, in its overgrown natural splendor, is a wellspring for much of what the artist does. “This might sound kind of weird,” began Hall, perched at a table in her studio on a hot summer afternoon, sipping from a glass of cold, tart kombucha. The walls and shelves are full of artifacts and raw materials. Doll heads, shoes made of human hair, tiny ornaments, thrift-shop objects that might be talismans. We could be inside a 19th century cabinet of curiosities. Hall moved around a lot as she was growing up. Her father often relocated for his job with a major military contractor, taking his family all over Europe, to California and, finally, to Fort Walton Beach, where she went to high school. That rootless childhood meant that, at an age when most kids leave home for the first time, she could claim to have finally found it. When Hall arrived in Tallahassee in 1983, soon to pursue an art degree at Florida State University, she took to the city like a caterpillar to a leaf. She credits teachers such as Jim Roche and Mark Messersmith — two of Tallahassee’s most potent and original visual artists — with some key life lessons. “Jimmy gave me permission to trust my intuition,” Hall said. That trust leads Hall to unexpected places. 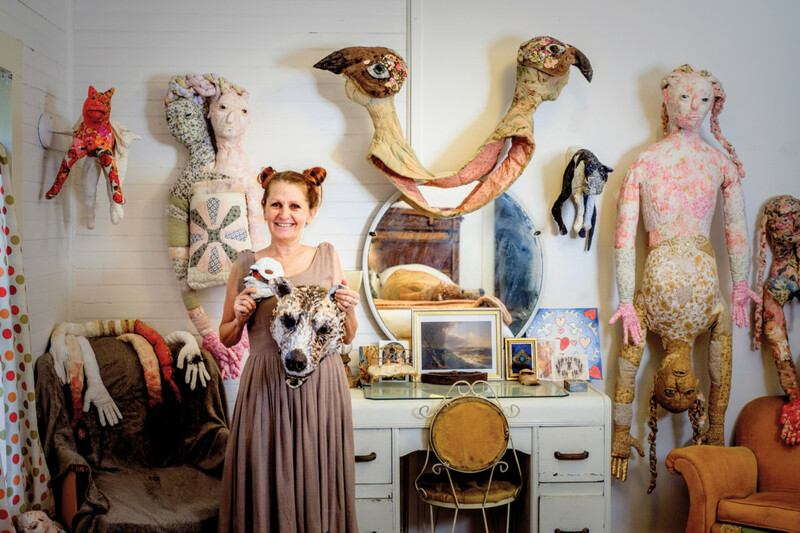 She has an ongoing relationship with Ghostbird Theatre, a theater company in Fort Myers, and she worked with singer-songwriters such as Tallahassee’s Patrick McKinney and New York City’s Peg Simone, often transforming the players into incarnations of her animal forms. This openness also speaks to Hall’s rejection of both high-toned galleries and academic frameworks as arbiters of artistic expression. Besides, it’s way more fun to take it to the streets. “When we’re in public spaces, unexpected things happen,” explained Hall, who early on mobilized mural-painting teams in Frenchtown, gracing the walls of a corner disco with a larger-than-life portrait of local jazz vocalist Pam Laws, for instance.